Say hello to your new BFF. This refreshing spray is what your skin needs to survive the summer heat. Not only for sunburn (though it’s great for that), our blend of cucumber, aloe, and coconut water heals and hydrates after a day in the sun. Stick it in your cooler when you head to the beach or the park and stay cool all day long. 1. Using a vegetable peeler, peel the cucumber and then peel one side of each aloe leaf to expose the gel inside. 2. Roughly chop the cucumber. 3. Using a spoon, scrape the aloe gel from the leaves into a measuring cup. You should have about 1 cup gel. 4. Add the cucumber, aloe, and coconut water (or tap water) to the blender (or food processor) and blend until smooth. 4. Strain the liquid through a fine-mesh strainer into the liquid measuring cup or a bowl. 5. Using the measuring cup, pour the strained mixture into a spray bottle. Store in the fridge for up to 1 month. 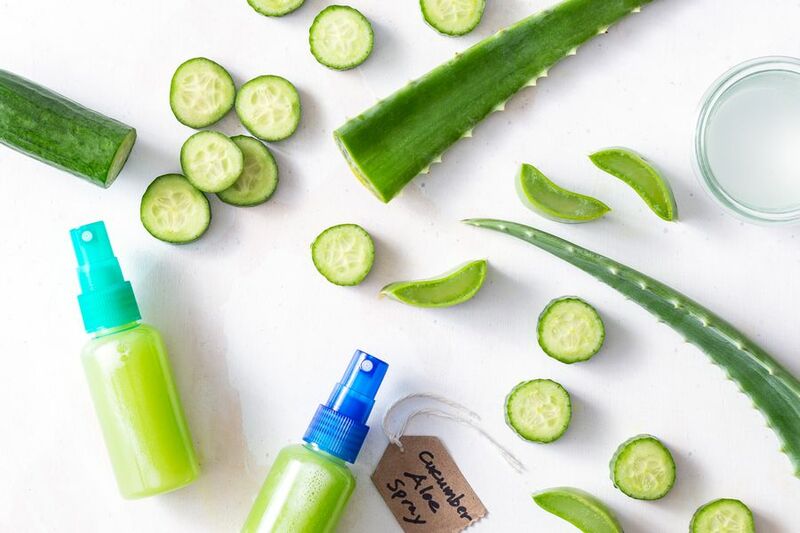 Ingredient IQ: Individually, aloe, cucumber, and coconut water are incredibly hydrating, so combining them into this cooling spray kicks their hydration powers up a notch. Additionally, aloe is soothing and healing because it’s packed with vitamins C and E, which can help refresh your skin if you’ve got a mild sunburn or an insect bite.